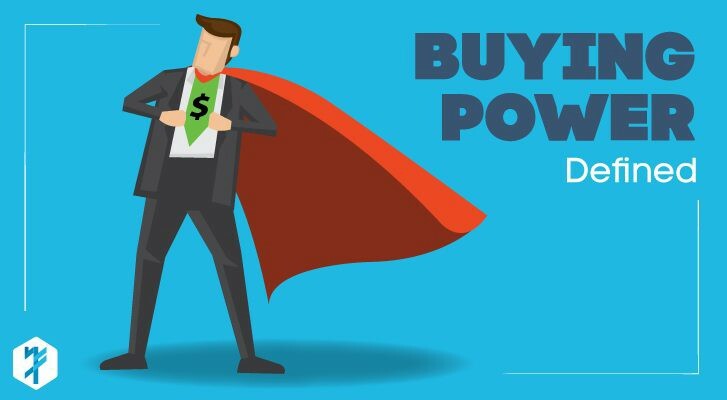 When traders talk about buying power they are talking about how much is available to purchase/short securities in their account. This can differ depending on what type of an account you have. Cash accounts will have buying power based on the amount of cash and excess equity in the account while margin accounts will have two times the amount of equity where traders can use more than their cash balance to buy stocks with borrowed money called margin. If your account is labeled as a Pattern Day Trader then you will have four times the buying power but it can only be used for day trading. If you wanted to hold a position overnight you would have to reduce your size to where you would only be using regular margin and not the day trading buying power. So if you had $25,000 in your account then you would have $100,000 in day trading buying power. In a regular cash account with $25,000 in cash you will only be able to use that amount to purchase stock with while in a margin account you will have twice that amount, $50,000, to purchase stocks with. However, it’s important to note that if you are using margin and the price goes against you by too much, you could be put in a margin call where you would have to liquidate a position and/or deposit more cash. Using buying power has its advantages and disadvantages. With it you will have the ability to purchase or short more shares than you would have normally allowing you to make more money, but at the same time it can magnify your losses and is why when using margin you will have to utilize excellent risk management skills. If you’re an option trader, it’s important to understand that you will not be able to purchase options using margin and can only use your cash plus any equity from securities not on margin. If you’re new to using margin its best to exercise caution and start off slow. Placing hard stops as soon as you get a trade is a great to limit exposure and give you peace of mind as you will know your loss amount before it happens. Sometimes when you’re in a trade and it goes against you it can be hard to get out and accept the loss which usually ends up in further losses. Cut your losers quickly and let your winners run.